There are some people (Group A) in this world who does not know / recite “irAmAnusAya nama”. Another group of people (Group B) realizes that they should not have any sort of association with the aforementioned people (Group A) even for a short while. The third group of people (Group C) prostrated at the lotus feet of those in Group B, realizing their greatness. The nithyasUris regard that their eternal wealth is nothing but the twin lotus feet of those people in Group C.
In thiruvAimozhi, nammAzhvAr said “thozhudhu ezhu en mananE (thiruvAimozhi 1.1.1)” at the very first pAsuram. nammAzhvAr adviced to his heart that it should fall at the lotus feet of sriman nArAyaNan. In the second decad of thiruvAimozhi, nammAzhvAr goes ahead and talks about the chantable name of “nAraNan” as seen in “vaN pugazh nAraNan (thiruvAimozhi 1.2.10)”. In this same formart, maNavALamAmunigaL exclaims the name of “irAmAnusan” in this second pAsuram. The first pAsuram is a case of “anvayam” (assertion) while this second pAsuram is an example of “vyathirEkam” (negation). In order to explain the significance of something, there is a practiced way of doing it. We talk about the greatness / superiority of a stuff in the first place. This is called “anvayam”. After this, we talk about the lowliness / inferiority of all other things apart from the thing that we want to focus. This is known as vyathirEkam. maNavALa mAmunigaL first talks about the greatness of ethirAsan in the first pAsuram. In this second pAsuram, he goes ahead and talks about the inferiority of other things other than “irAmAnusAya nama”. 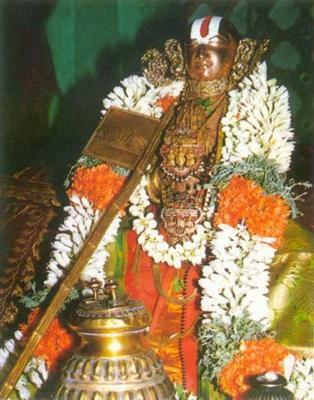 Thus by using the concept of “anvayam” and “vyathirEkam”, maNavALa mAmunigaL celebrates the greatness of ethirAsan. Our scriptures prescribe that one needs to incessantly meditate upon the sacred manthra namely “irAmAnusAya nama”. However, a vast majority of the people do not know about this and even if they do know they do not practice it. These people are being referred as “prathikUlar” or the ones who stand against (in one’s journey towards liberation). These people do not do this basic need of sustenance, i.e., chanting and meditation upon SrI rAmAnuja. They are said to be devoid of this basis sustenance product and are being compared to a four legged animal like cow. There are certain other group of people who dread these “prathikUlar” and maintain a stand that they should never co-exist with them even if it is for a short while. These people who always dread them are called as “anukUlar” or those who stand in support of a person in his journey towards liberation. There exists another group of people who prostrate and surrender unto the twin lotus feet of such “anukUlar”. nithyasUris celebrate the lotus feet of such group of people who surrender to “anukUlar”. As can be seen in the phrase “arumpERu vAnaththavarkku (gyAna sAram 4)”. This entry was posted in Arththi prabandham, Other and tagged arththi prabandham, mamunigal, ramanuja on June 15, 2016 by santhanam rajagopalan.